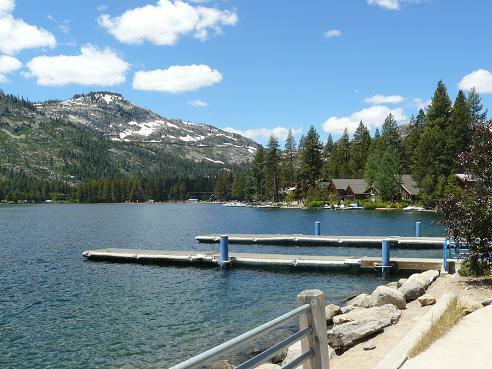 Donner Lake is the Jewel of the Truckee, California Lakes! Donner Lake is one of my favorite places in Truckee, California! The most breathtaking views of the lake can be seen from Old Hwy 40 like the picture below that I took of the lake on 02/28/11. There is a viewpoint stop just before you reach the Rainbow Bridge where you can stop and take photo's. The east end of the lake closest to Donner Memorial State Park was completely frozen at the time. While the lake is gorgeous in the summertime, in the winter, it is truly outstanding with the snow on the mountain ridges surrounding the Lake! Donner Lake is where I wouldn't mind living eventually. 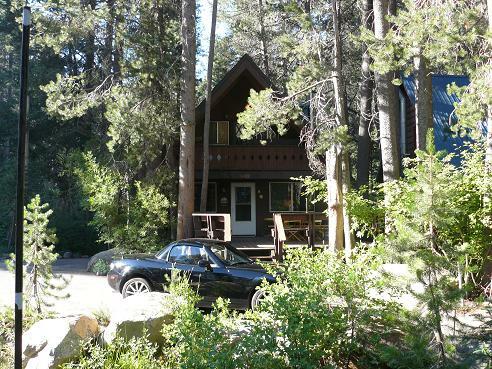 My friend has a cabin within walking distance to the Donner Lake Property Owners Beach, and it is just such a relaxing life to hang out at the lake. 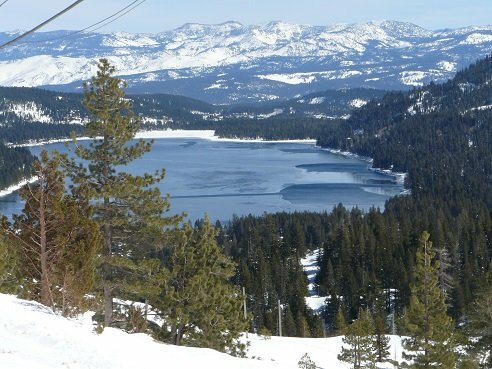 For those wanting to Live in Truckee, purchasing a home on or near the lake is a great option, as the elevation, and thus the snow load will be lower than in some of the higher elevation subdivisions such as Tahoe Donner. 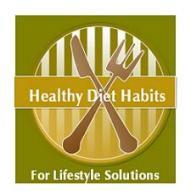 You can check out my Donner Lake Neighborhood Page for more information on the neighborhoods. 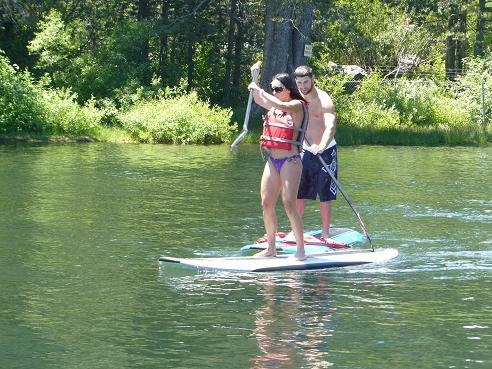 There are so many activities to do at the lake and Donner Lake Vacation Rentals abound! 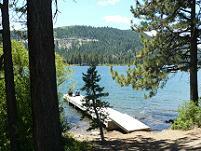 Boating - You can use the Public Donner Lake Boat Ramp to launch your own boat. 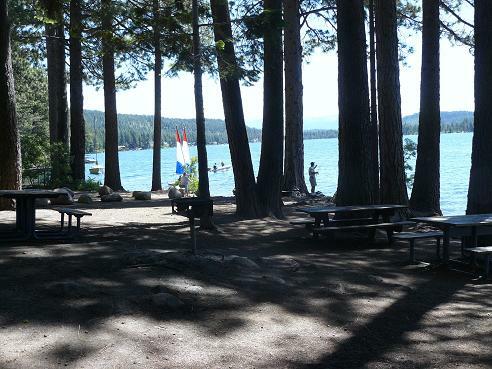 Camping - Donner Memorial State Park has 154 Campground sites. 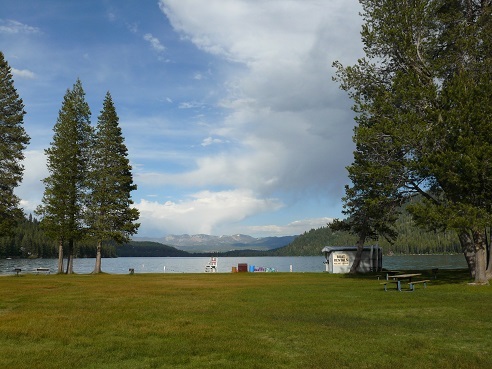 Donner Memorial State Park - at the east end of the Lake, is a great place to camp, bike, and hike, as well as visit the Emigrant Trail Museum where you can learn all about the Donner Party. Fishing - Fishing Boats can be rented at the Donner Memorial State Park and the Shoreline Park has a great All Access Fishing Pier. 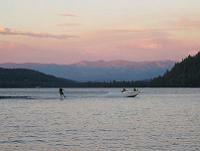 Boats can be rented at West End Beach, or Donner Memorial State Park. 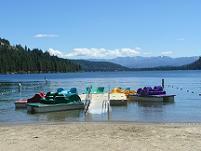 If you are a Tahoe Donner homeowner, you can also rent boats at the Tahoe Donner Beach Club at the east end of the Lake. Check out all the Truckee Summer Activities! Also...check out the Truckee Sporting Good shops and shop local for all your Truckee Summer Activities! Donner Lake in Truckee California as viewed from Shoreline Park. This is a great place to have a picnic because it has lots of shade. It is also a great place to watch the sailboats and fish at the all-access fishing pier. 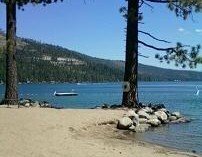 Check out my Truckee Beaches page for more beaches in the surrounding area and my Lake Tahoe Beaches page for beaches around Lake Tahoe. 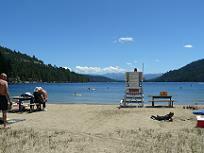 Above is a picture that I took on June 6, 2013 of Donner Lake from West End Beach. There had been afternoon thunderstorms, and a little rain come through, and the beach was pretty deserted after that! Each year, there are some great Truckee Events that happen at Donner Lake. Holidays in Truckee are awesome and some events like the Fourth of July event, are annual events that residents and vacationers alike look forward to each year! Cost: 2015 Price $6.00 in advance only from Truckee Donner Recreation and Park District starting May 1, 2015 to Residents only. No tickets sold at the door. Pictured Above: My college roommates daughter, Danielle Widenmann Mualchin coming in 2nd in her age group at the Donner Lake Triathlon on July 17, 2011. 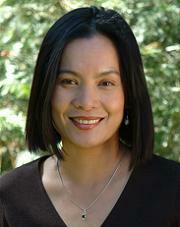 She placed 1st in her age group in 2009. 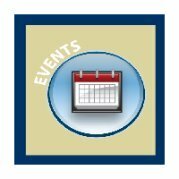 Please check out my Truckee Event Calendar for details on these events, other Truckee Events, and some North Lake Tahoe events! The Photo's above, will randomly change with all of the photo's that I have uploaded in the Truckee Travel Guide's Flickr photo's "Donner Lake, Truckee California Photoset". To view all the photo's, just click above on the "Donner Lake" blue link to view the entire set of photo's. 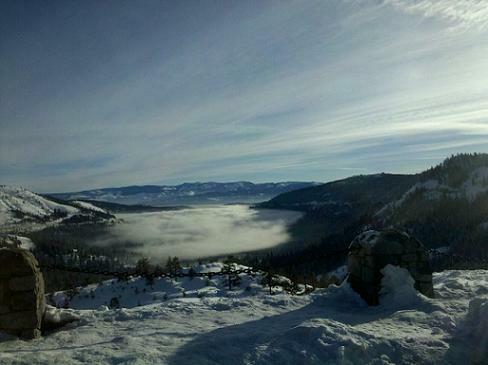 Be sure to SHARE YOUR PHOTO's with Truckee Travel Guide, and have your photo's and stories become part of the website! The lake sometimes freezes in the wintertime as you can see in some of my pictures! There are approximately 1,500 full time residents, and over 6,000 people on holidays and summertime! 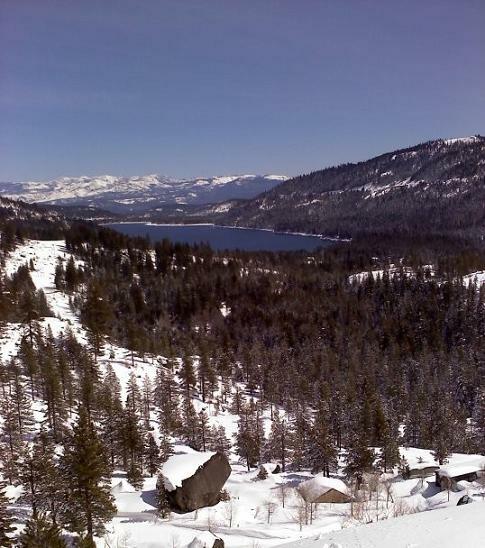 It is the site of the "Donner Party" saga, and the Emigrant Trails are located near the Lake. Check out the Emigrant Trail Museum located in the Donner Memorial State Park! The depth of the Lake is approx. 328 feet at it's deepest point, according to the California State Lands Commission. Photo Credit: Pictures taken from the Old Hwy 40, Rainbow Bridge viewpoint by Ben Weisner, of Tahoe City. Used with his permission.